The new BMW 2 Series. BMW has added another number to its ever-growing list of nameplates - this time it's the 2 Series. This blossoming range is a bit of smoke and mirrors really, but while BMW splits other models to make up the numbers, there are brand spanking new vehicles being added left and right as well. This is essentially the new take on the 1 Series coupe, with that badge now focused on hatches. 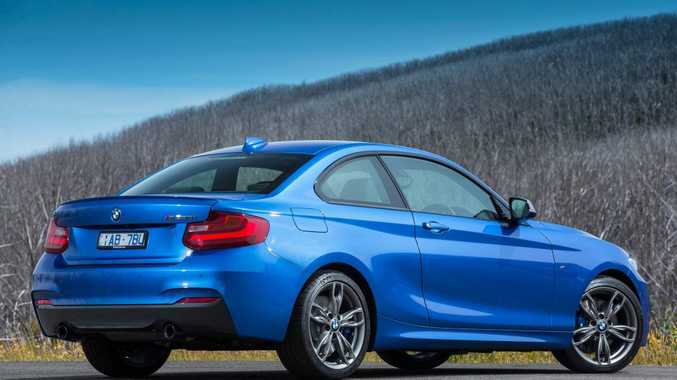 BMW focused on comparisons with 1 Series for obvious reasons, with Coupe replacing the older model, although growing up a bit and getting more spec in the process. Three variants are available - all with twin turbo power plants. Under the bonnet of the 220i lives a two-litre turbo four-cylinder that uses direct injection and a twin-scroll turbocharger to produce 135kW/270Nm and accelerate from 0-100kmh in 7.0 seconds. The baby petrol coupe consumes just 6.0L/100km (average) and meets the Euro 6 emissions spec with just 139g of CO2 per kilometre. The diesel is even more miserly with average consumption of just 4.4 litres for every 100km and CO2 emissions of 117g/km. The gap between the pricing of the two four-cylinder cars and the M235i is significant, but so is the difference in performance, with the angry M235i capable of hitting the 100kmh from standstill in just 4.8 seconds, using its launch control system. The straight six also relies on a twin-scroll turbo for its wallop, making an impressive 240kW - more than the same engine in both the 3 Series and 4 Series models, and justifying the M designation. On top of the sporty M trim touches, the 235i also gets leather interior, blue four-pot brake calipers, adaptive suspension that can drop the car 10mm closer to the ground and BMW's clever variable sports steering for more direct steering when it's set on performance modes. There's also a higher-specification audio system and rear view camera standard. The car's media launch event was held on the wild and woolly roads of our much-maligned southernmost state. Tasmania has twisty and entertaining country roads - and a lot of them. We drove all three versions of the car on a long road route that took in more country lanes than big motorways, which showed just how well set up the car is to handle quick driving on tight roads - it's less twitchy than its 1 Series ancestor because of the wider track and longer wheelbase, but the whopping serve of power and torque from the M235i means getting traction down can be a bit of an exercise. The diesel-powered 220d is a very able little thing. Although the heavier donk had a tendency to bounce the rear end around when driving quickly, and although it's a very good car, the jump up to the 3 Series diesels would make more sense for most buyers, and those who favour smaller machines can get into the sharply-priced 1 Series hatch. After experiencing the cars on public roads, we headed to the quaint and weird little Baskerville Raceway to put the licence-risking potential of the M235i through its paces. Again the power of the car set the traction control light strobing fairly regularly, but either dialling in its Sport+ setting with less invasive stability systems or being ever so slightly more subtle on the accelerator did the trick. It's a brilliantly balanced two-door, with 50/50 weight distribution that does make it ultimately drivable on the throttle, which is fine on the track, but, not surprisingly, frowned upon on public roads. It's a stroppy performer with heaps of personality and is definitely rewarding and engaging no matter how hard it's pushed. Calmer settings do dial its aggression back a lot, but like most things that have an M badge, or better still are belting M cars, it does tend to bring out the frustrated race driver in you. Model: BMW 2 Series Coupe. Details: Two-door rear-wheel drive compact coupe. Engines: 220i in-line four-cylinder turbocharged petrol generating maximum power of 135kW @ 5000-6250rpm and peak torque of 270Nm @ 1250-4500rpm; 220d four-cylinder turbo diesel 135kW @ 4000rpm and 380Nm @ 1750-2750rpm; M235i six-cylinder in-line turbo-charged petrol 240kW @ 5800-6000rpm and 450Nm @ 1300-4500rpm. Consumption: 220i 6.0 litres/100km (combined average); 220d 4.4L/100km; M235i 7.6L/100km. Performance 0-100kmh: 7.0 seconds; 7.1; 4.8. Bottom line plus on-roads: 220i $50,500, 220d $52,500, M235i $79,900.